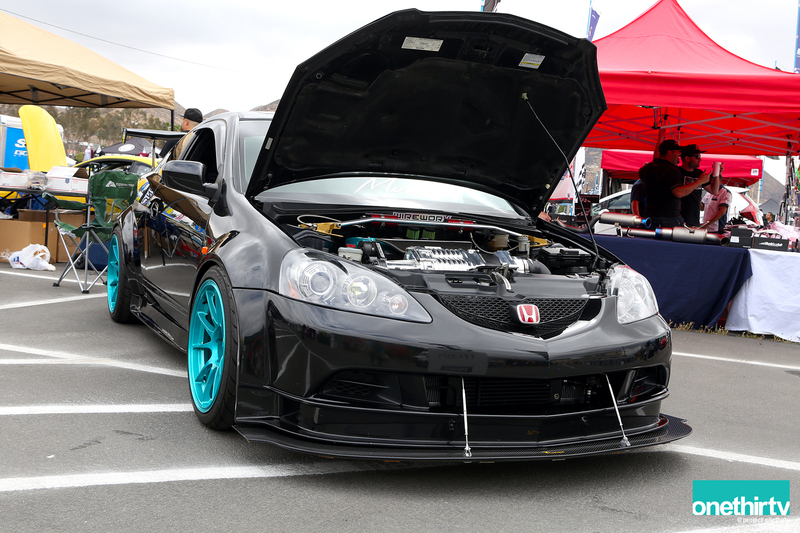 Our coverage of the Eibach Meet continued, as I slowly made my way through the vendors section, I tried to take my time and look around before the gates were opened to the public and the flood began. If you missed our first part, make sure you head over to it and get caught up. 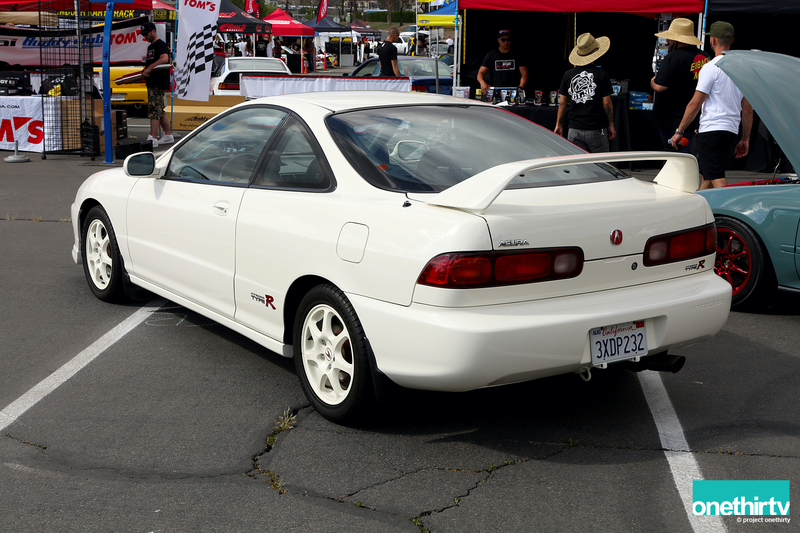 I hadn’t seen J’s Racing DC2 since the 2011 Eibach meet which was held at Eibach’s HQ. 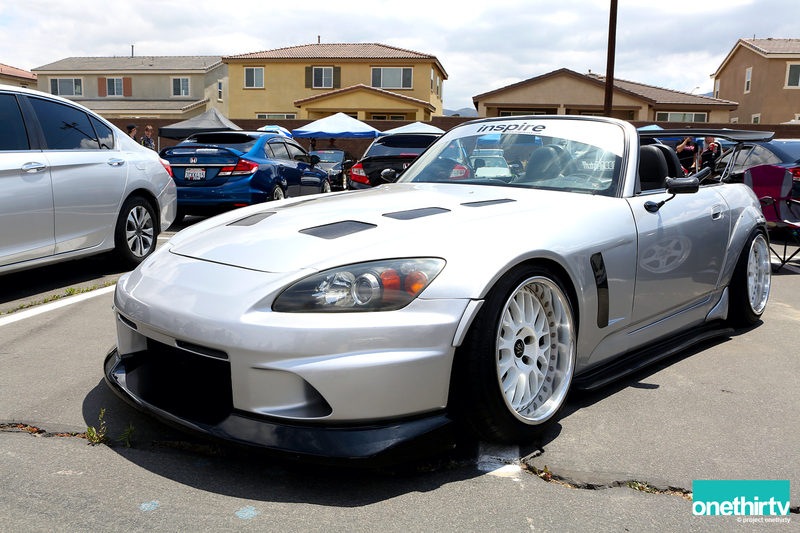 Another wide body FI S2000; INGS front bumper and CE28 wheels. 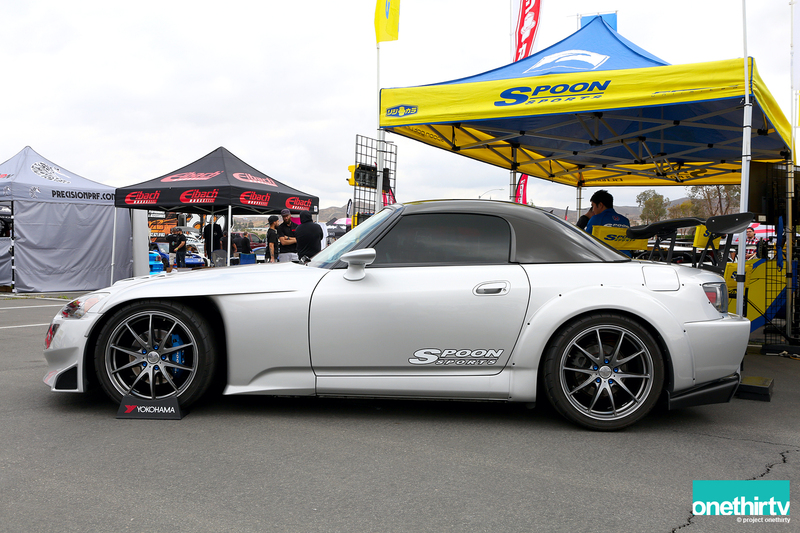 I am a big fan of Enkei 555R wheels but I had never seen an aggressive set in a FF car. I think it looks good. Tom-Attack’s EF at the Wilwood booth. 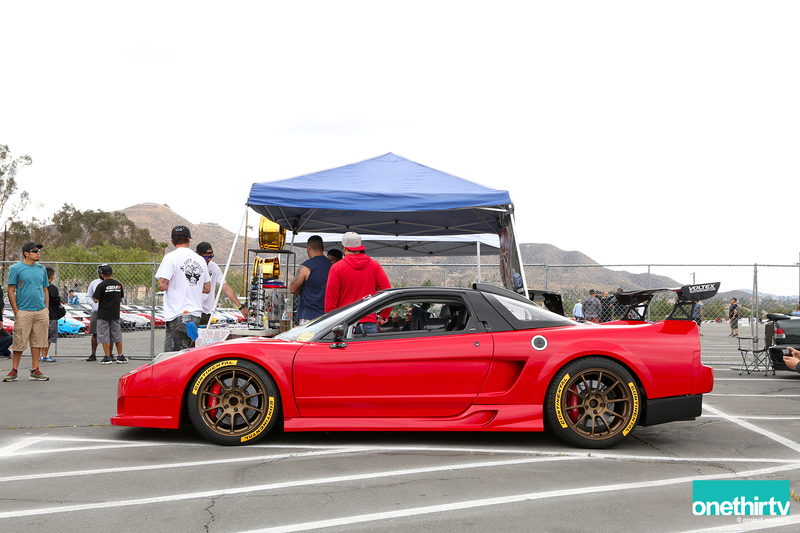 Michael Mao’s NSX now sporting Volk ZE40. I liked these wheels a lot better. 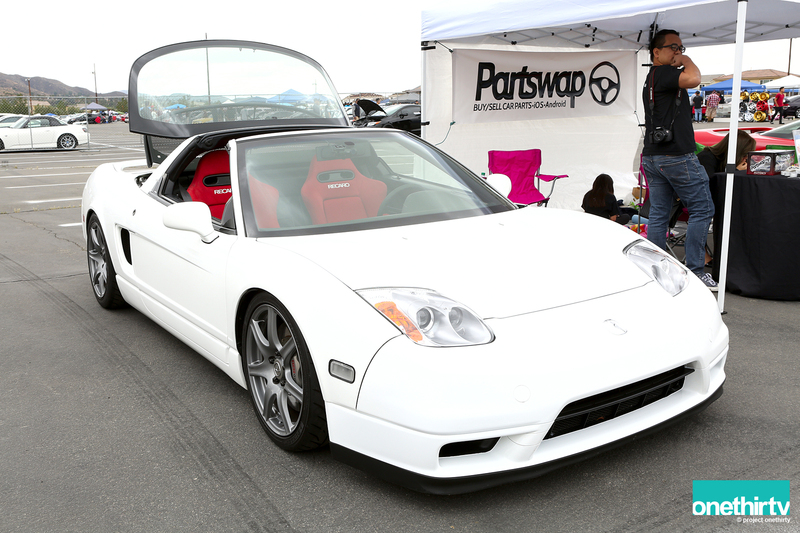 Never heard of Partswap before but they had a couple Acura NSXs. This Zanardi edition was the variant of the Type-S and probably one of my favorites available stateside. 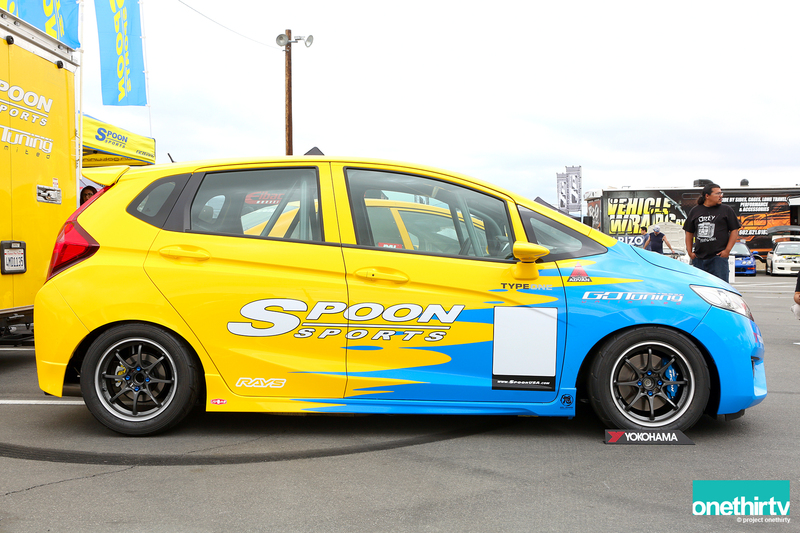 Spoon Sports had their repertoire of racecars at the GoTuning booth. My OCD would drive me crazy if I were to drive a car with that window-film protector on only one side. 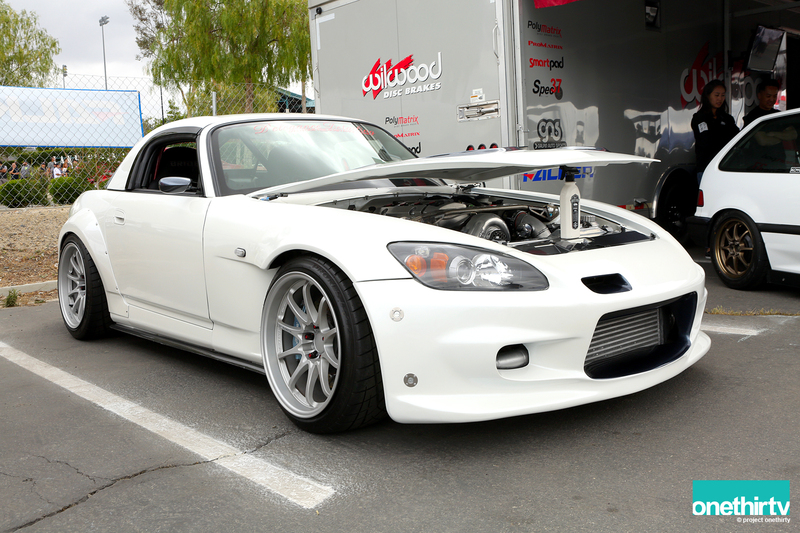 This S2000 had the Open Air Top system and this was my first time seeing it in person. 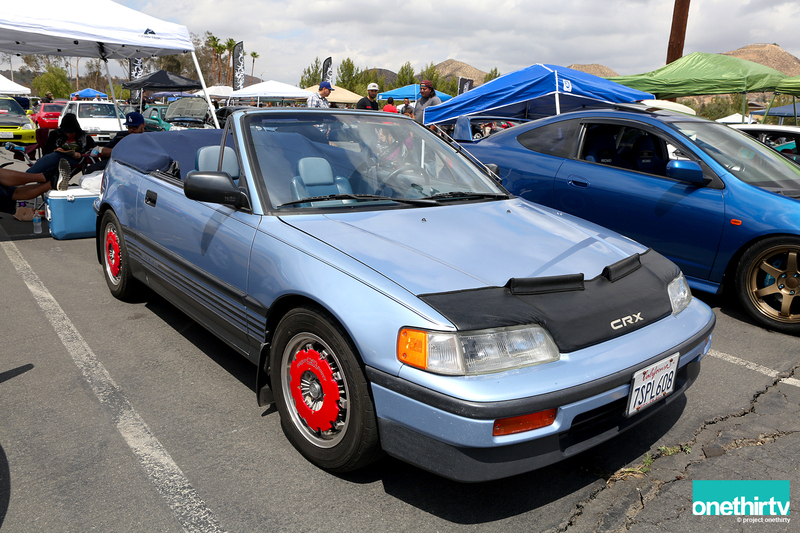 Hmmm, I will take the OEM top any day. 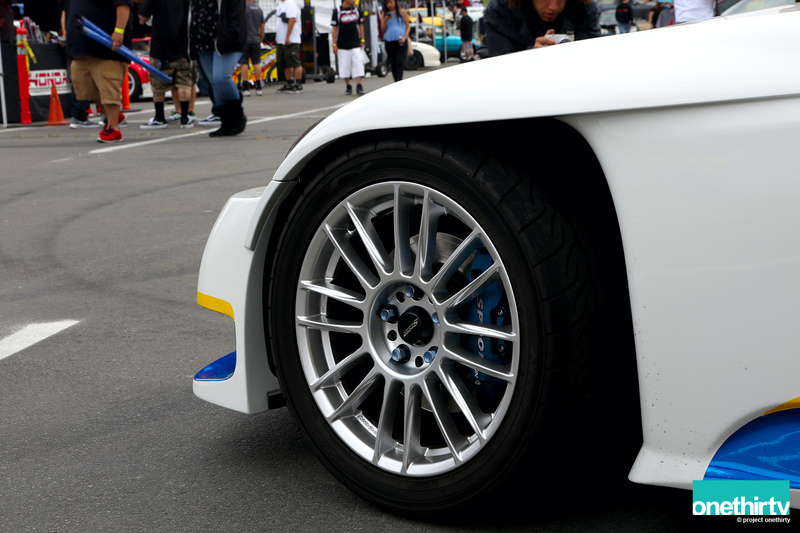 Spoon Sports Monoblock calipers sitting behind CR93 wheels which are not as popular as one would think. 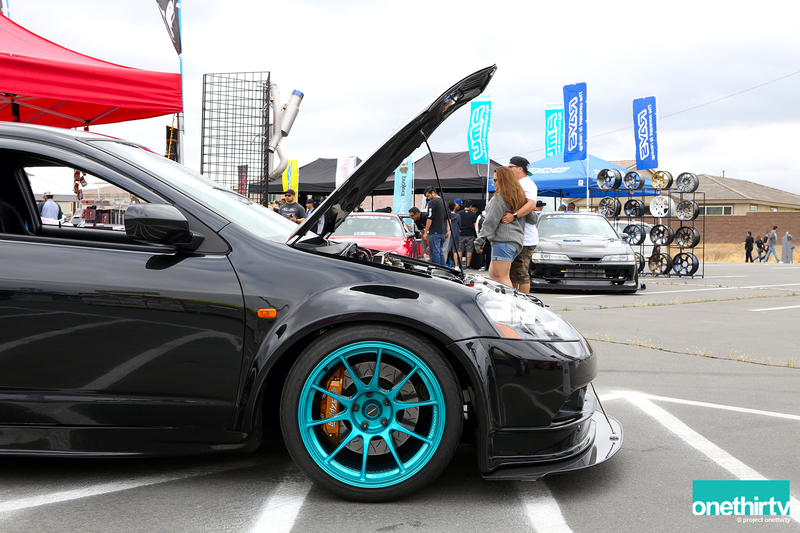 Another set of wheels that you don’t see all the time, Volk G25. 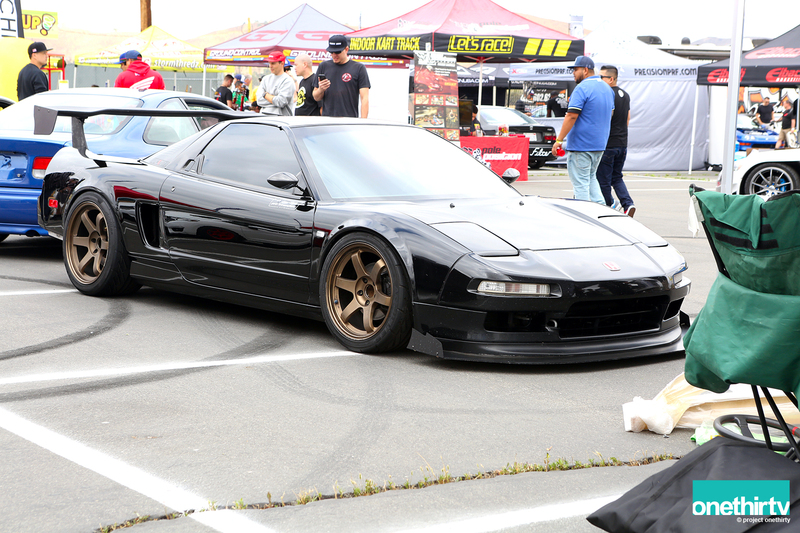 Bronze TE37 on Nemo’s Garage NSX. Bronze and black – always a winning formula. 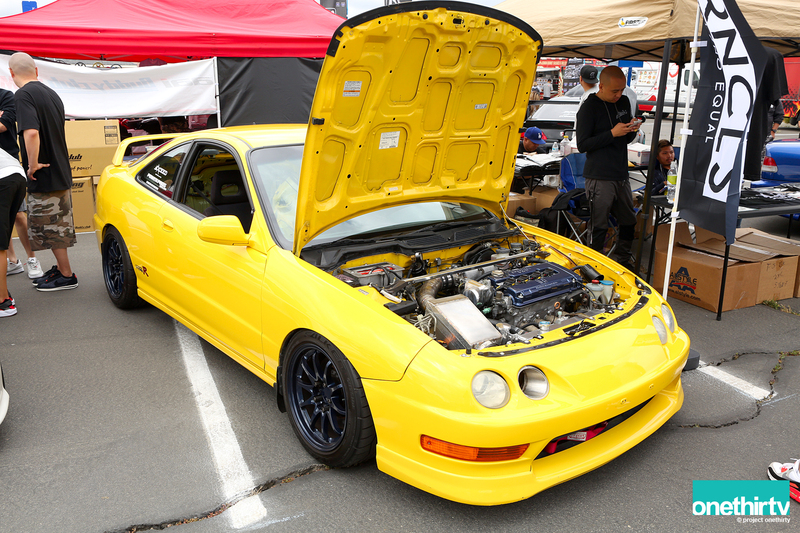 DPK Chuy’s Integra Type R at the Chronicles had an intricate intake system. 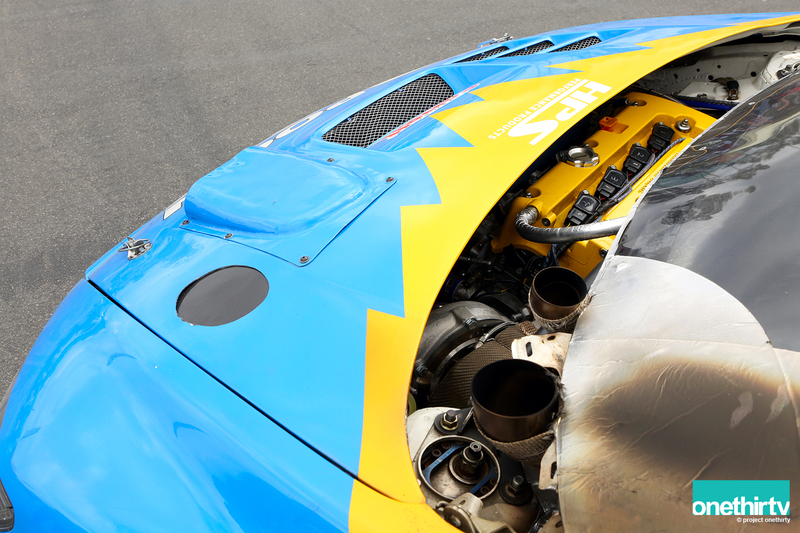 Close up of the intake. 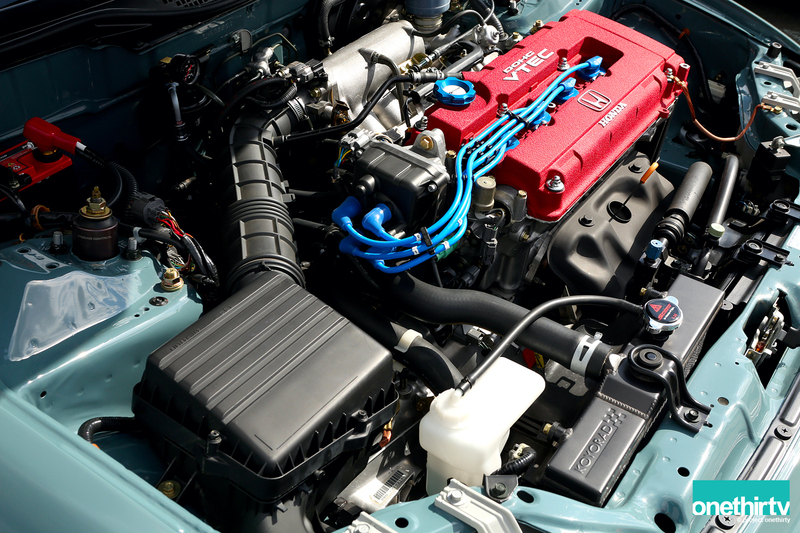 I also like how the valve cover matches the Mag Blue wheels. 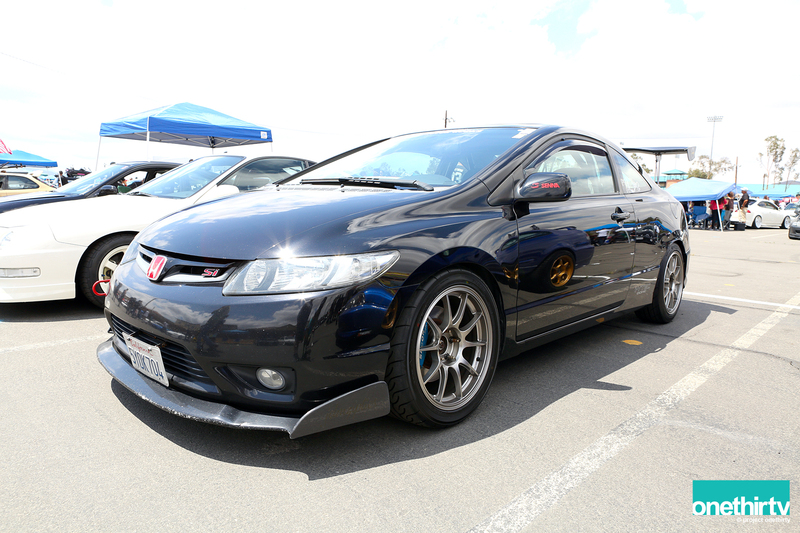 Next to it was DPK Darryl’s K-Powered and supercharged Si riding on Mugen MF10s. 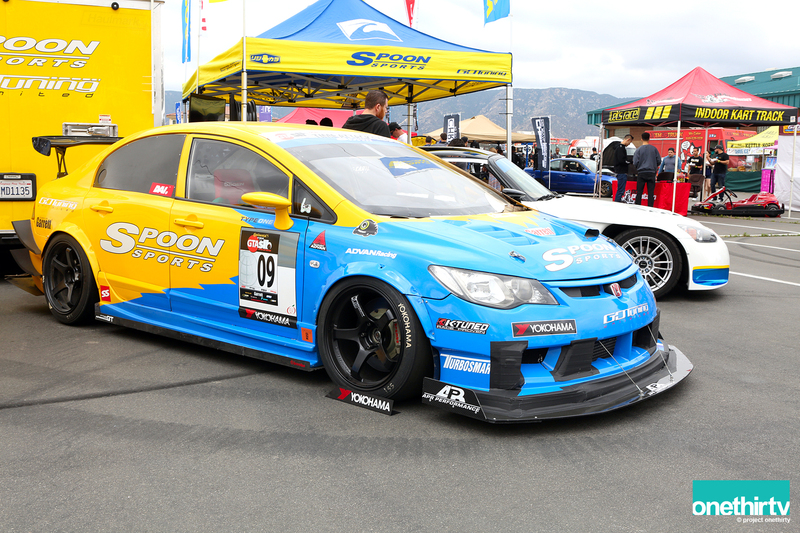 Buddy Club had this WTCC widebody kit with wide teal WedsSport TC105N and Buddy Club big brake kit. I really liked the color combination of the car. 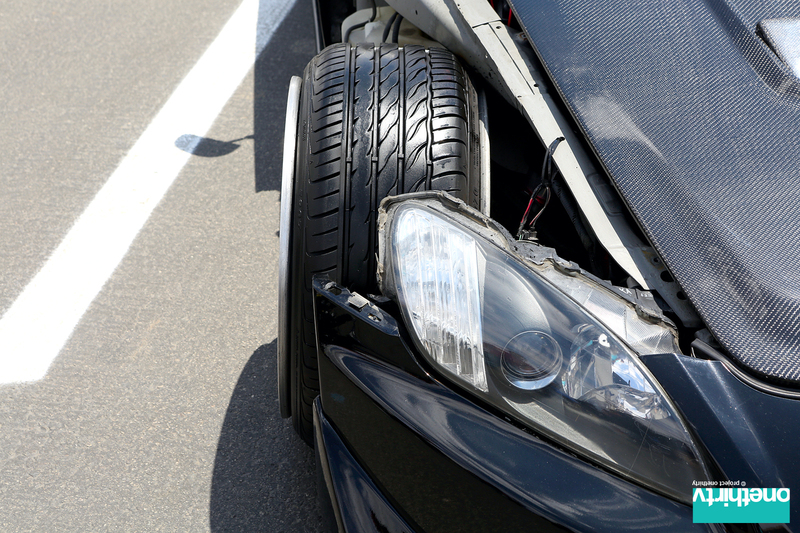 I think the front tires had a 285-width section. MMMMmeaty. 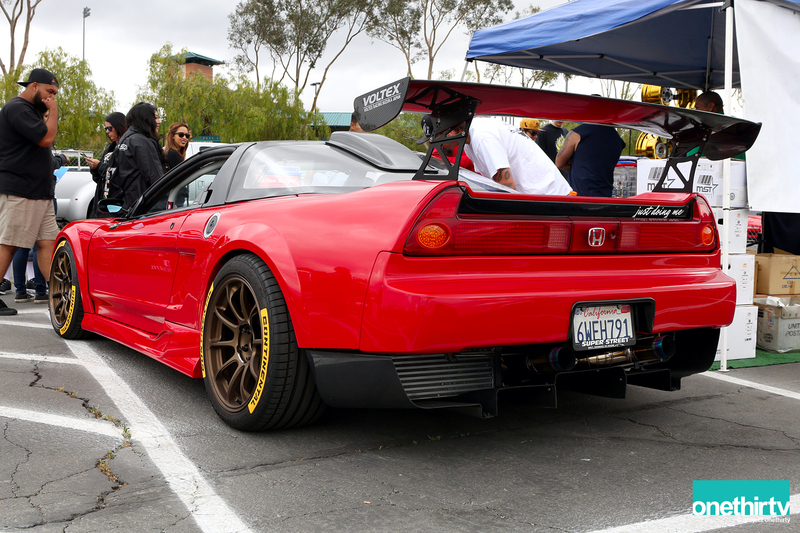 Another shot of Nemo’s Garage NSX. 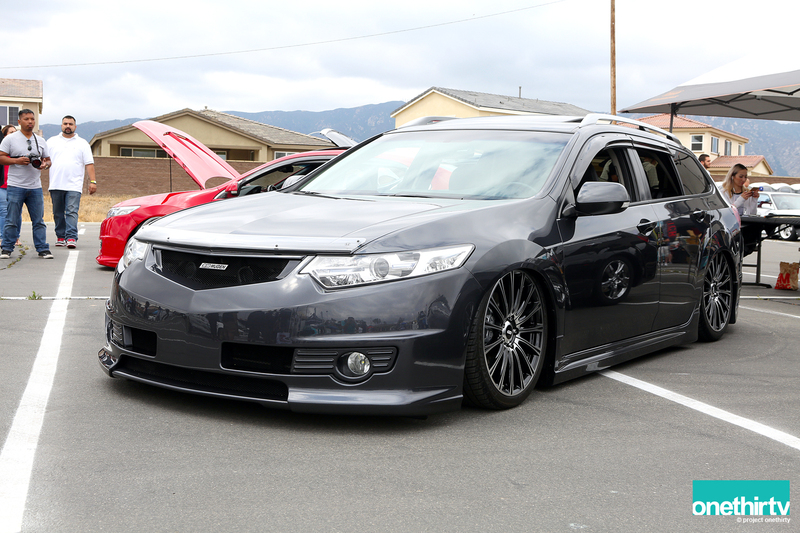 Tom Chu’s Mugen themed TSX station wagon was on point. 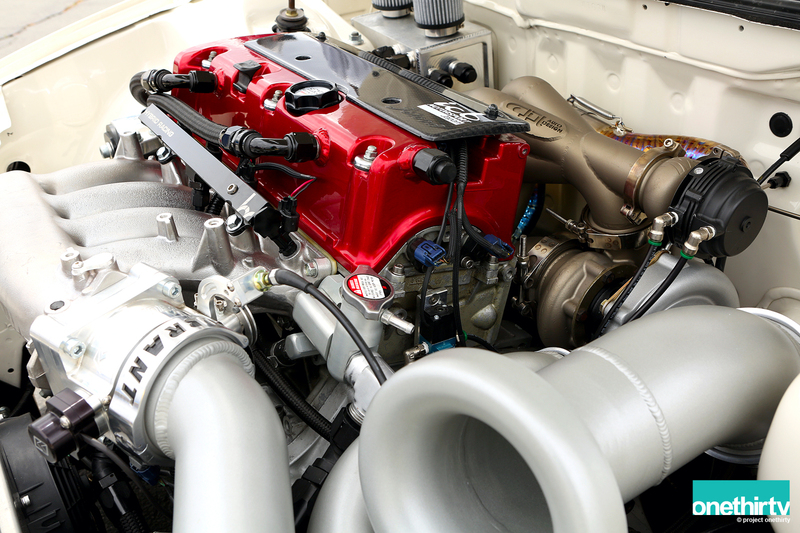 Under the hood is a KraftWeks supercharger. And just like that I was back at what Matt called the ICB Island. Doors were about to open, and I wanted to get a few close up shots of the cars at ICB. 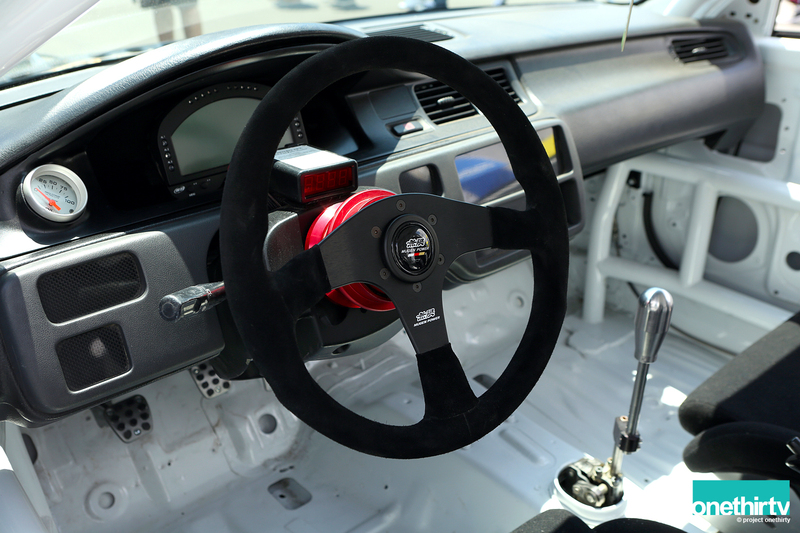 Another shot of Mike Blancke EG with a JBlood/ICBJ CF sparkplug cover. My view at work that day wasn’t too bad. 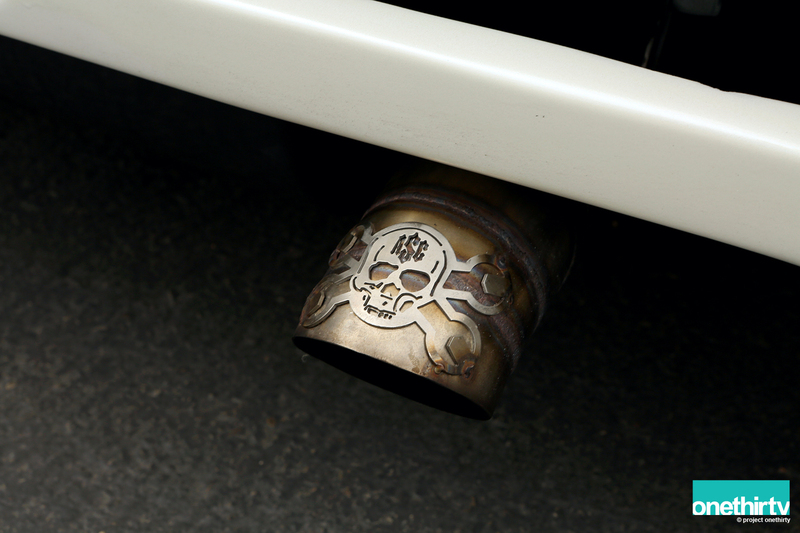 Close up of Gen 1 Mugen exhaust. 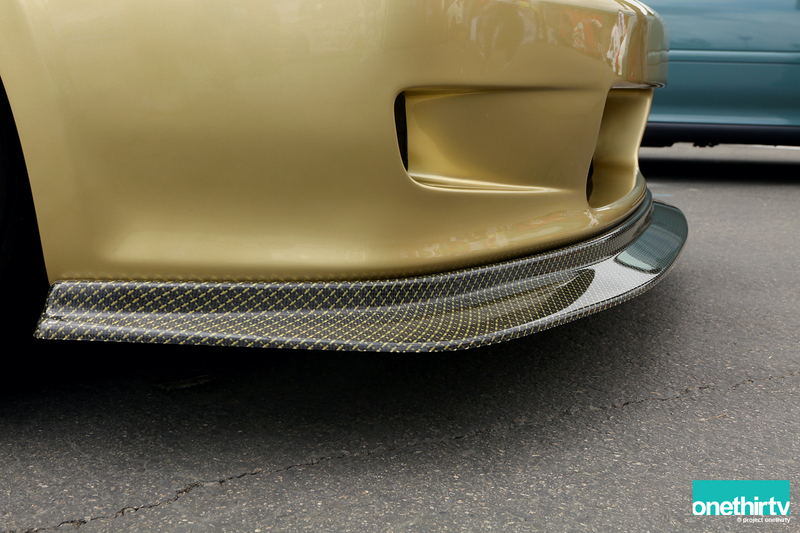 Jorge aka the Godfather had the trifecta of Carbon Kevlar. 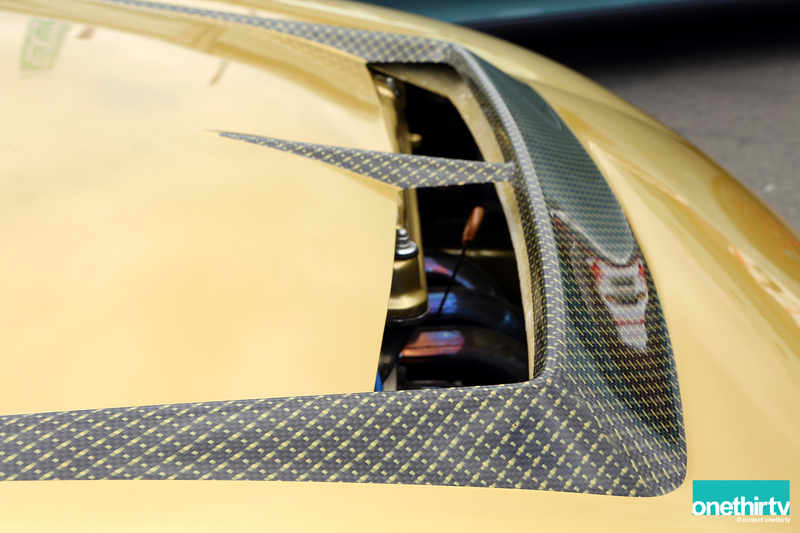 The Kevlar goes so well with the gold paint. 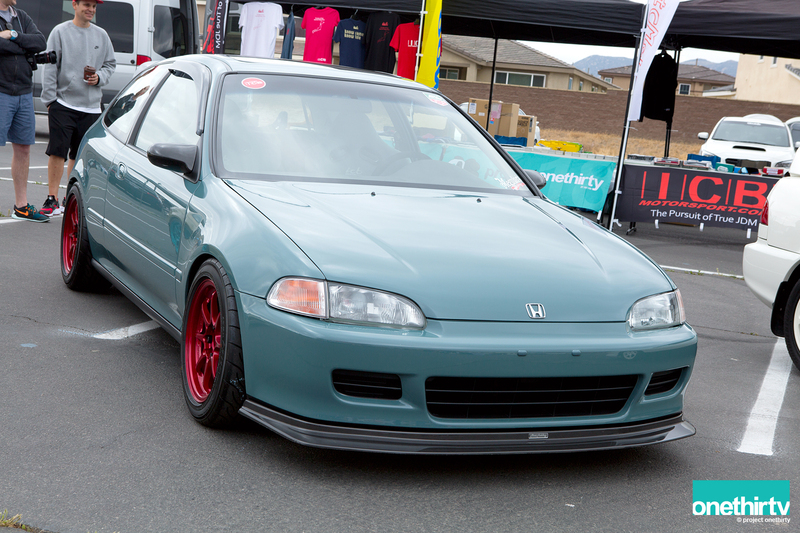 A couple more of Jason’s EG. 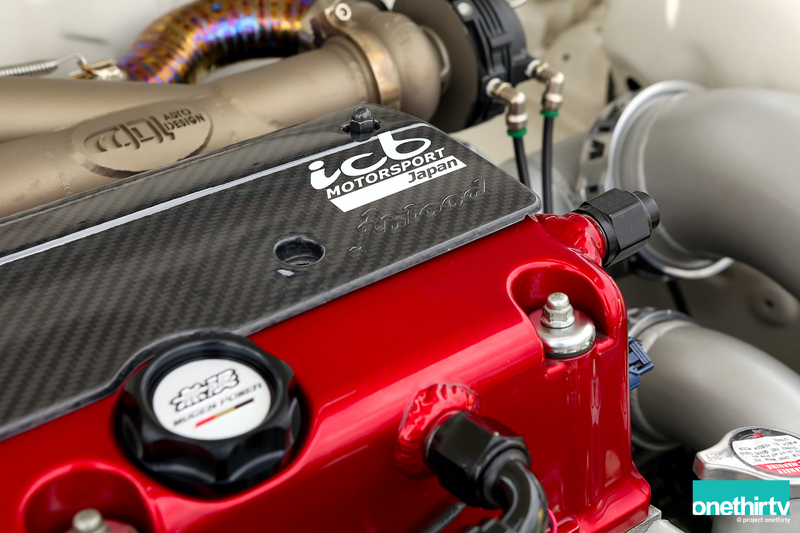 Just like the wheels, I like how he the red Type R valve cover stands out. So at this point, the gates opened and people quickly started moving around. I spent a few hours helping Matt sell items, and then I realized that the event was going to end so I decided to walk around. George and David came with me. 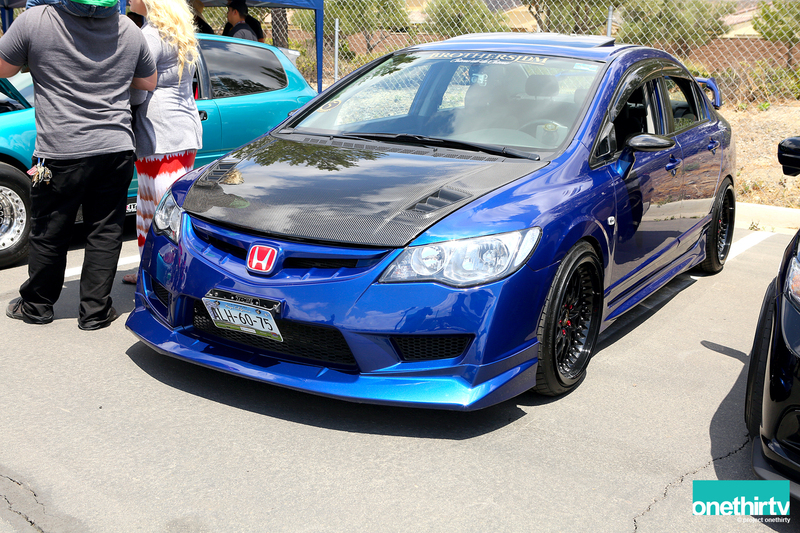 I was surprised to see Johnny Ortiz walking around, an even bigger surprise was finding out that his Civic was at the event all the way from El Paso TX. I knew his hatch had just come out of the paint shop and I wanted to see what it looked like. 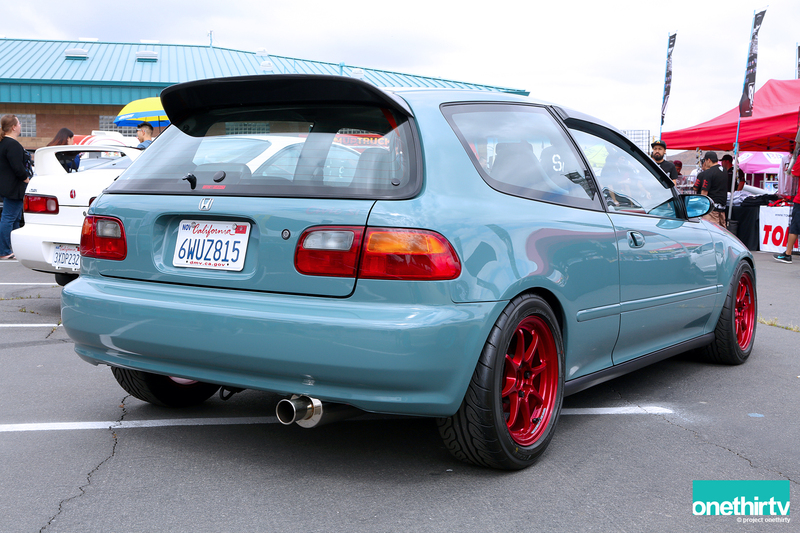 I had to admit his EG looked incredibly good. 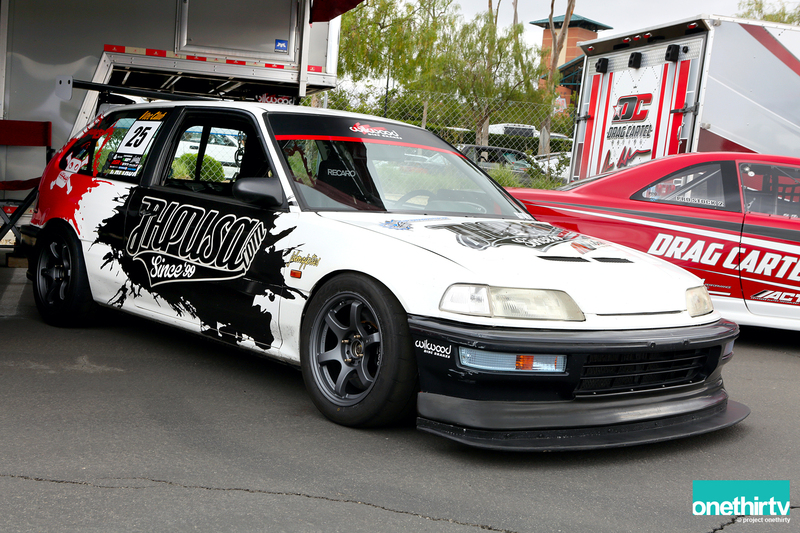 I am not going to lie, his Civic reminded me of another track-built EG…from the Phoenix area. The white on white theme makes it look like the goody goody of the two. “I don’t want any trouble.” I don’t know where Johnny was when I was looking at the car, but Ally told me that the car was ready for a track event that was coming up in a couple weeks. Enjoy the fresh paint sir! I am glad that they both made it out, and that they brought the car out. We kept walking and things started to get interesting. I was looking around at some of the builds and some of them were definitely head-scratches. I really did not understand some of the builds and the logic behind them. 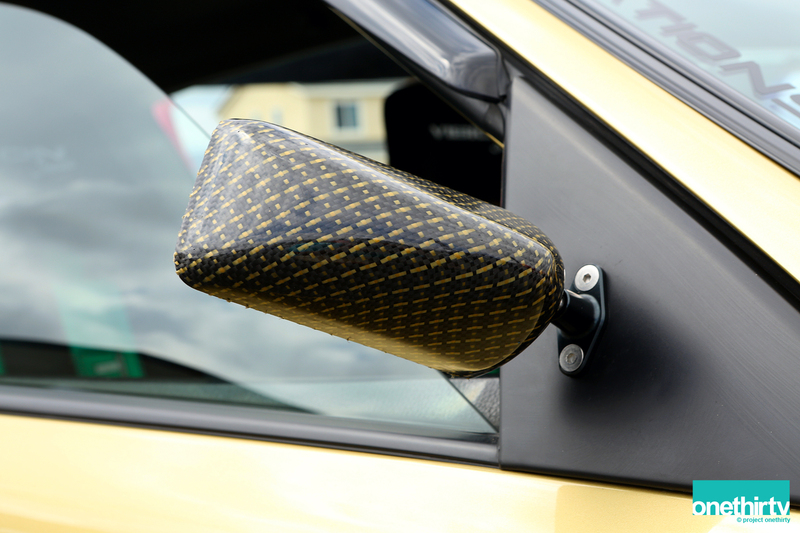 While this was going on, an irritating yet familiar noise traveled throughout the rows of cars. What started as one person – thinking they were the Chuck Norris of fast cars – revving their loud cars (and not a good loud),ended up with an entire group of people doing the same thing. It reminded me of when a dog starts barking at, hmm say a person walking by, and the next thing you know, you have all the dogs in the neighborhood barking because of that first dog. Then you just want to punch yourself and stab your ears with pencils. Don’t you worry, this is annoying here as well as everywhere else in the world. I seriously cannot describe how annoying it was. It always happens at events but I think this one took the cake. The only thing this caused was us rushing to leave that area, which meant we didn’t get to see a lot of cars. However, I got some that grabbed my attention. 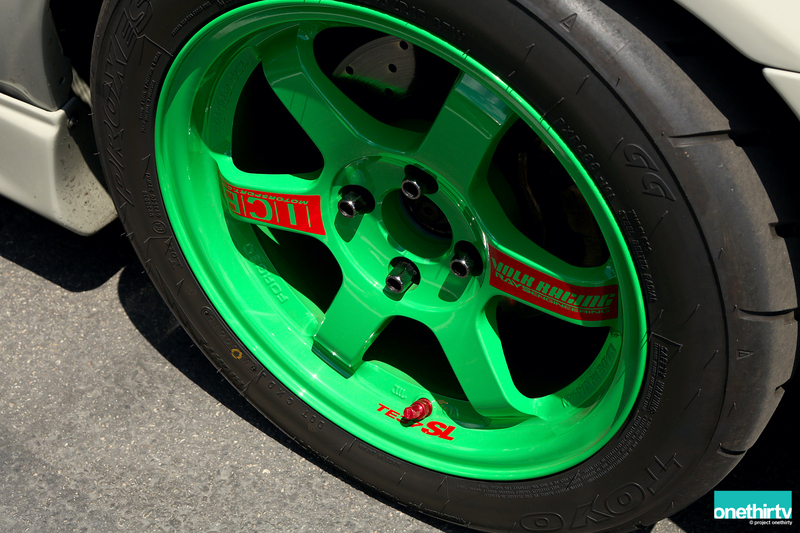 Always a fan of Takata Green TE37s, and these ones had a special decal. Different for sure. 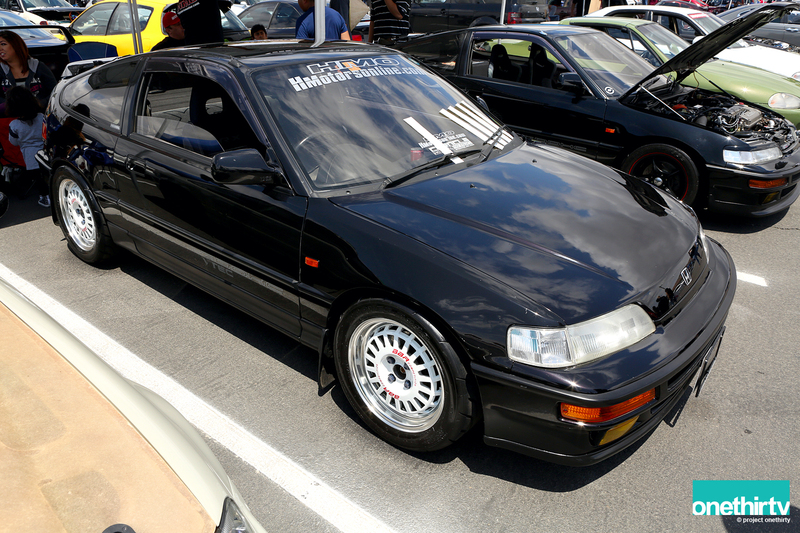 Right hand drive EF on BBR Competition wheels. 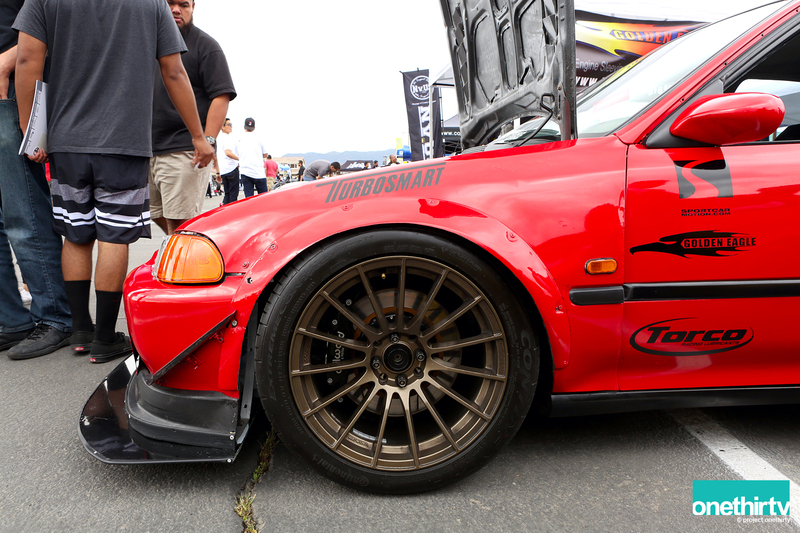 Next to a Mugen themed EF. 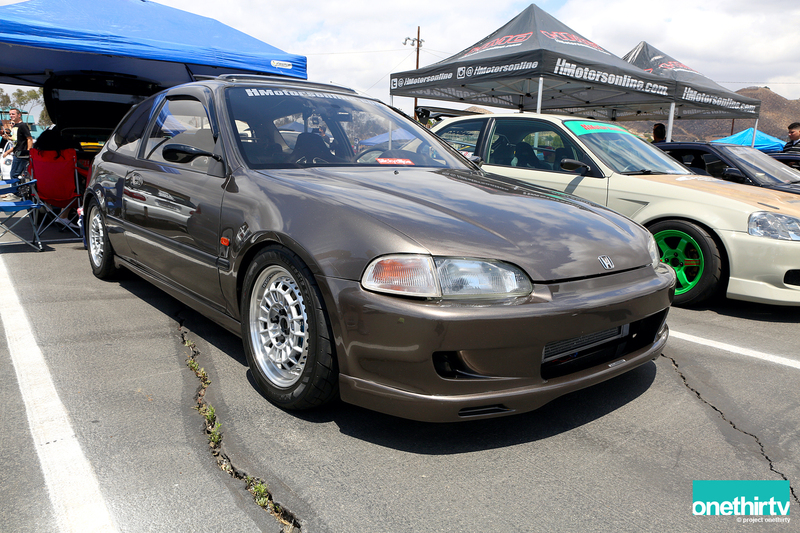 Very clean Civic riding on Hasemi Motor Sport S5 wheels. Engine bay was just as clean and very shiny. 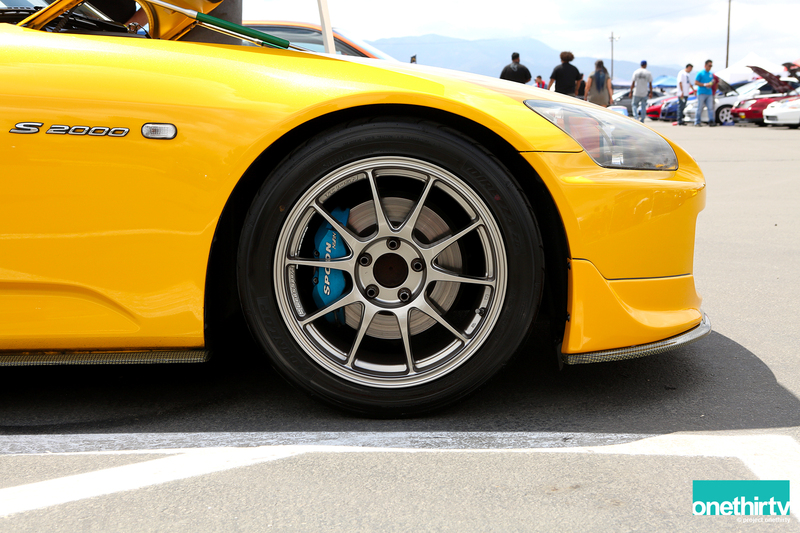 FD Civic on Work Rezax wheels. 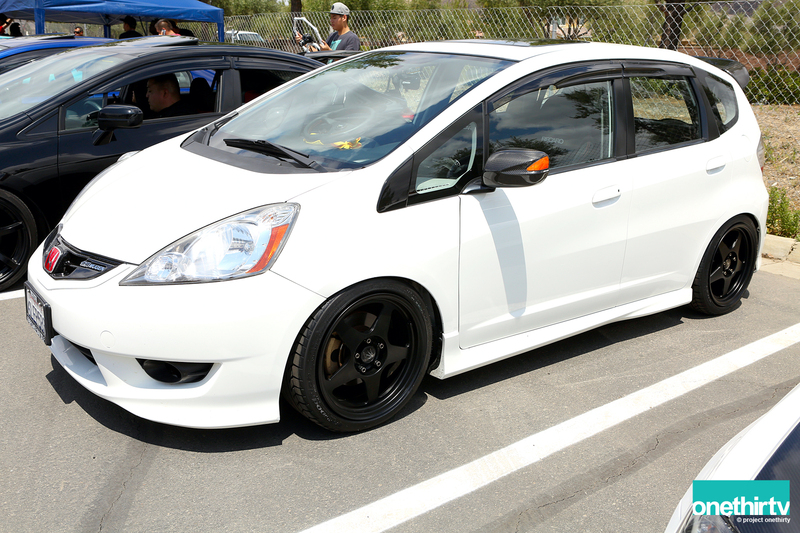 Honda Fit on Regamaster Marquis Promada was looking good. 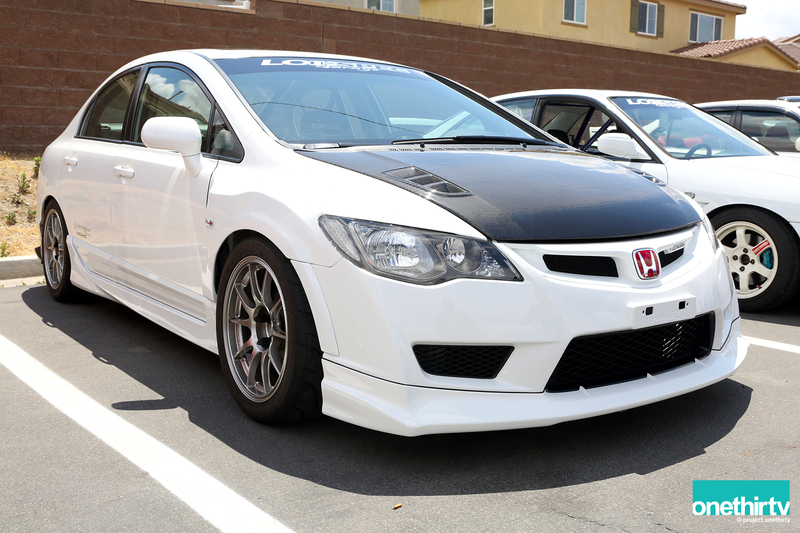 Another FD Civic riding on Volk ZE40s and Spoon Sports brakes hidden behind them. I started to notice that people were paying more attention to the noise and the cars making the noise rather than actually noticing really good-looking cars. Maybe it was not like that all day, but it was like that when I was walking around. 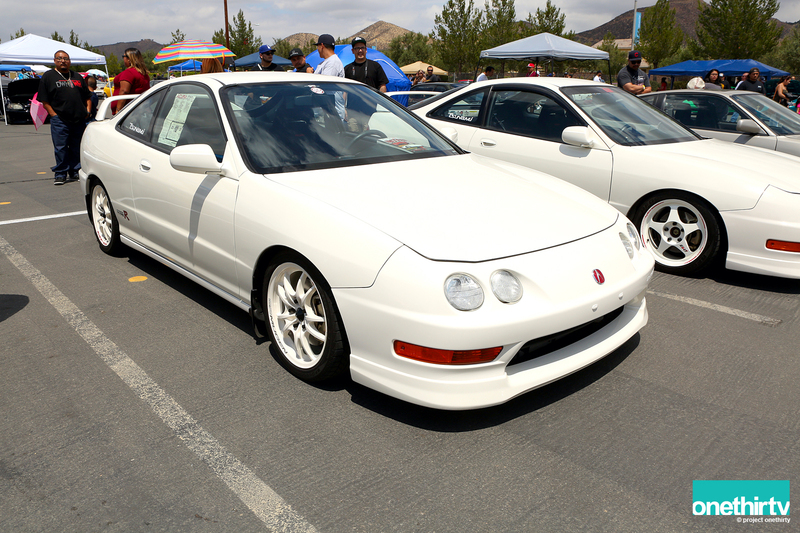 A couple Integra Type R’s from Tsunami. 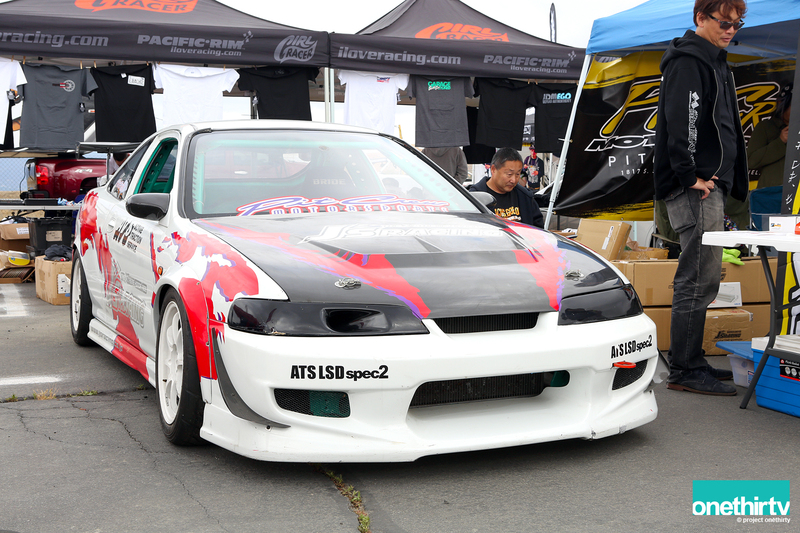 One riding on Regamaster Evos and the other one on Mugen MF10s. I really liked the color on these SSR wheels. 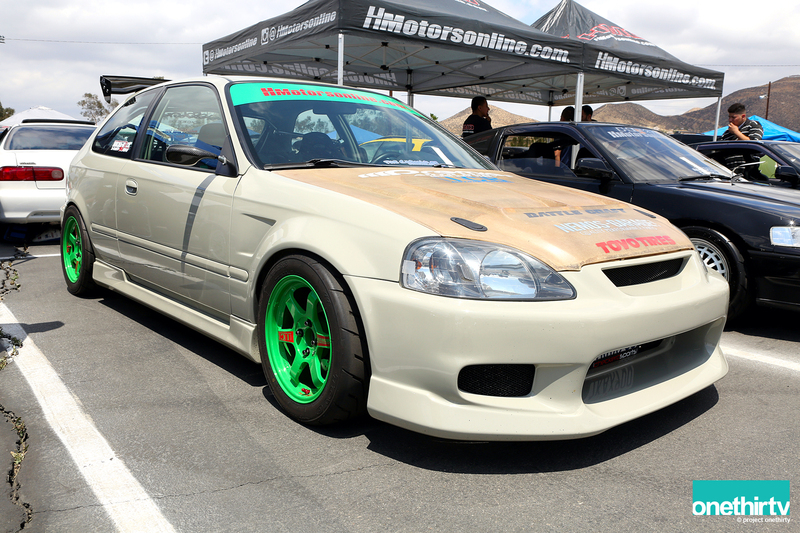 Civic Si that looks like it gets to see track time. 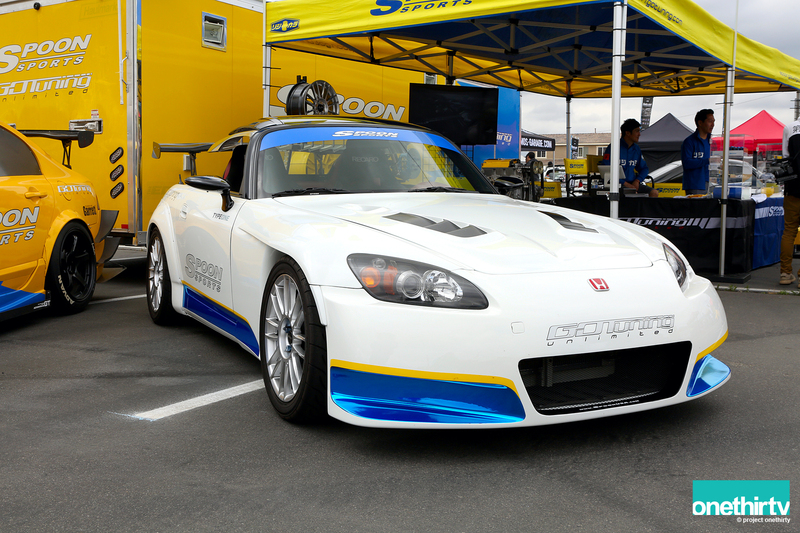 S2000 with ASM front bumper and Enkei NT03+M wheels. Loi-Spec Garage was on full force. Big fan of Wedsports TC105N, it was a popular choice that day. 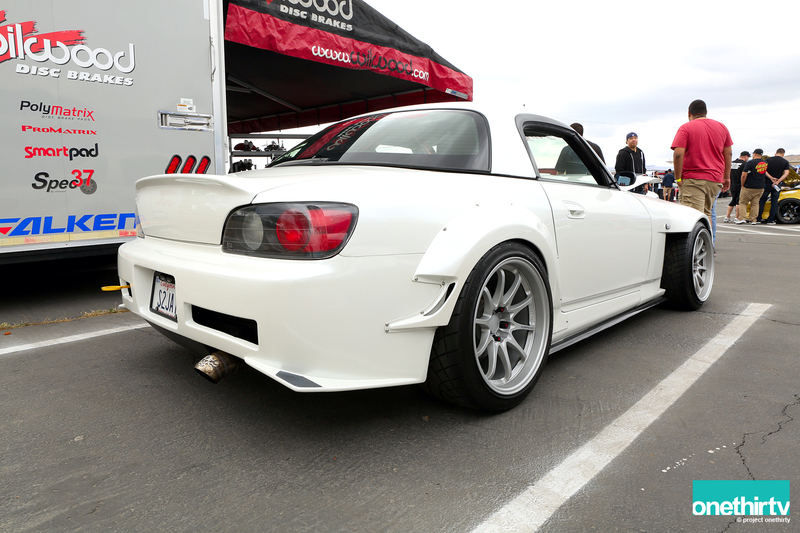 And yet another set on this S2000. 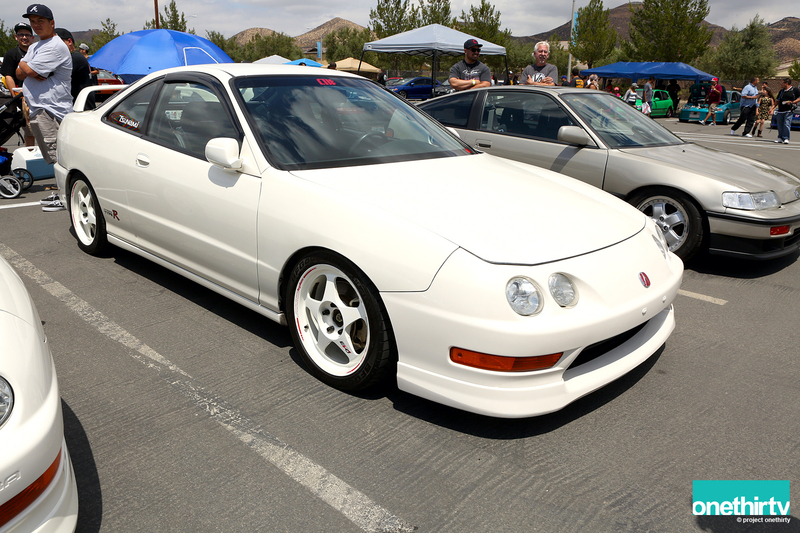 Really liked the color on this Integra, white TE37s set it off. 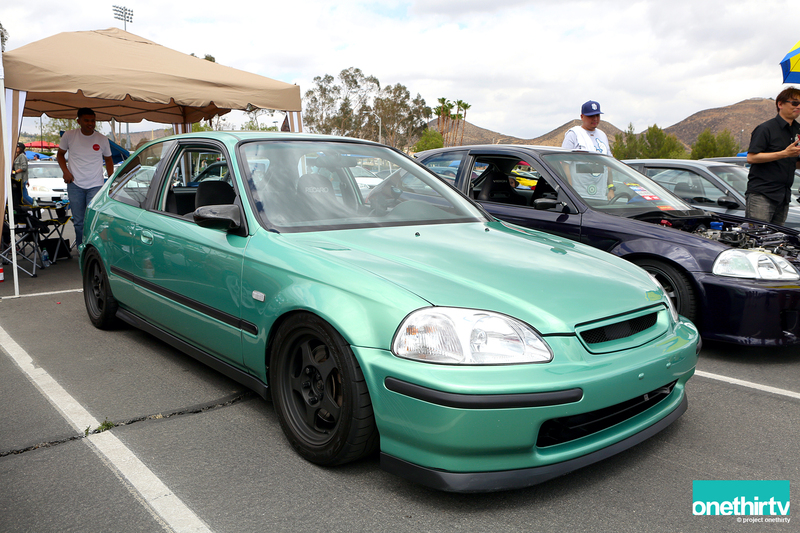 Midori green Civic with SiR bumpers. The car looked rather smaller in person than in photos. 235/35/19 and Brembo brakes mean business. 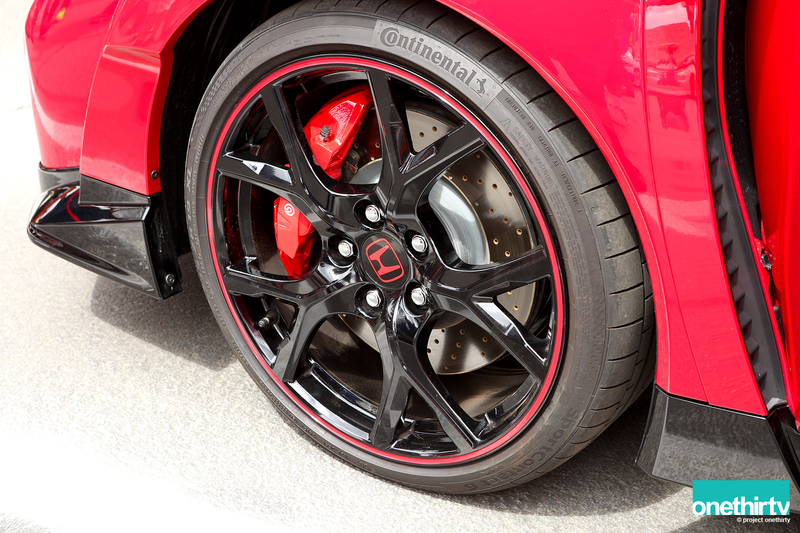 It is crazy how things have “grown” with this new Type R. I mean the first gen Civic Type R had 195/55/15 tires. 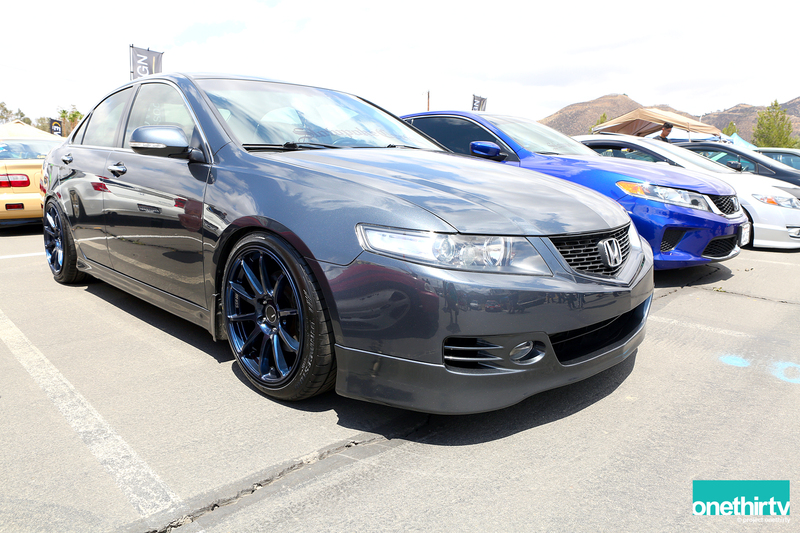 Such aggressive lines for an OEM car. 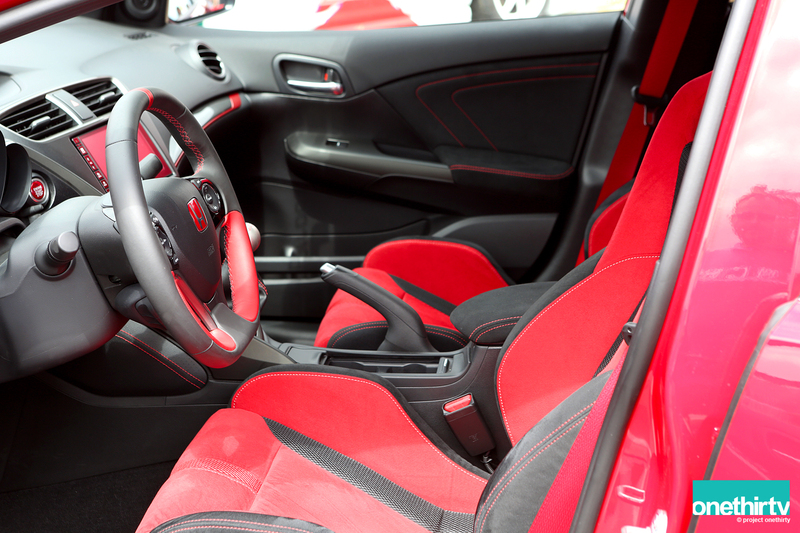 C’mon Honda stop playing with our emotions. So as you can see, my time outside the vendor area was kind of fast. The noise was a huge turnoff and I wondered if other people felt the same and if they too ended up leaving early. 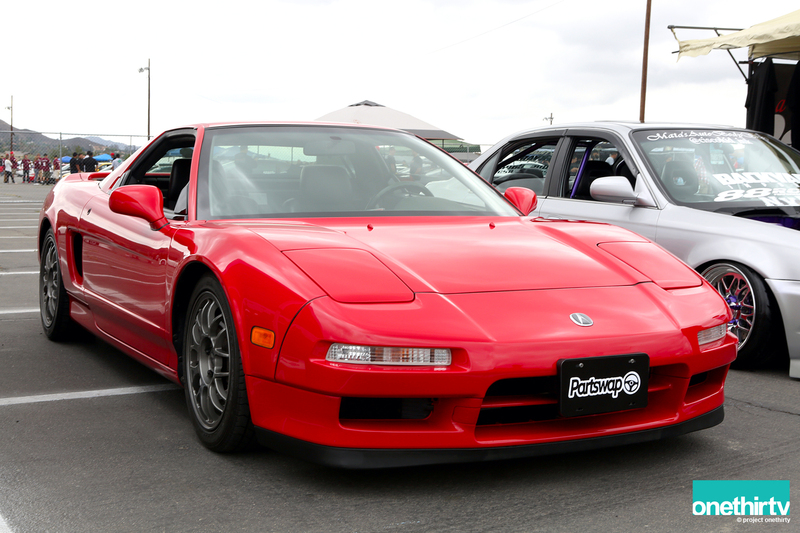 I heard that there was a group of NSXs that I didn’t get a chance to see. I wonder why they left so soon? I mentioned earlier that I didn’t understand the logic of some of the builds out there. I don’t want to put anybody on blast, but this is a good example here. I have no idea what is going on. I also hope they didn’t put any Armor All on the thread. 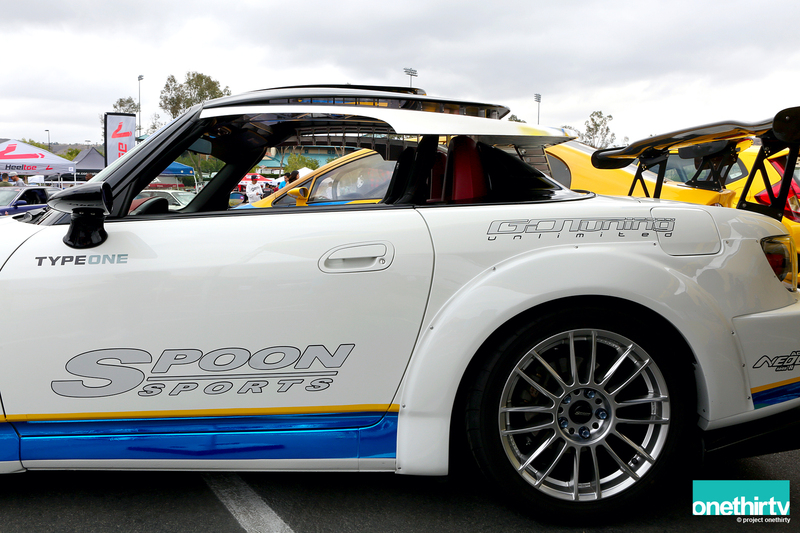 At the moment, I see a theme where people try to imitate race cars and the reality is, they make their cars slower and or un-drivable than when the vehicle was stock. I witnessed my first set of “Ravs Engineering” wheels and I just shook my head and walked away. This got me thinking and I kept asking myself. Why do we tune/modify/build cars? What is our motive? Is it fair of me to say to someone that they are wrong for liking something that I don’t? This is very cliché to say, but we live in a society were we all want instant gratification; we all want to share it with the world and be liked. I think the passion with some of the younger generation is lost, and it is something you can clearly see with some of the builds. At times it seems as if they slapped something together the night before and said, “lets roll ya’all.” This reminded me of an episode of The Simpsons in which Homer invents a make-up gun for ladies to ‘get ready’ very quickly. You can see the clip here. 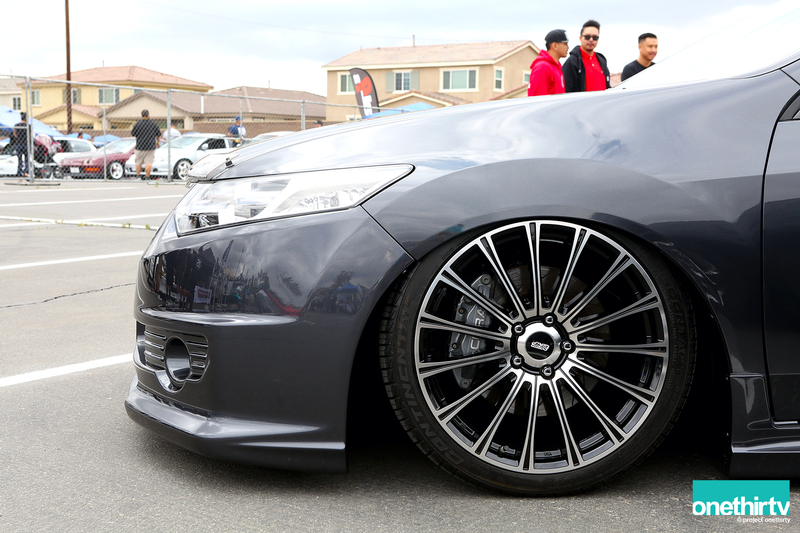 I also know that our industry has a group of people that have a ton of passion for their builds. And you know this is not achieved overnight -the end result speaks for itself. Year in and year out, they make small changes/additions and you can see the progression on their builds. At times you don’t think they could possibly do something new, but somehow they do. I know these are two extremes, but I hope the latter continues to inspire and pass the torch onto the next generation. 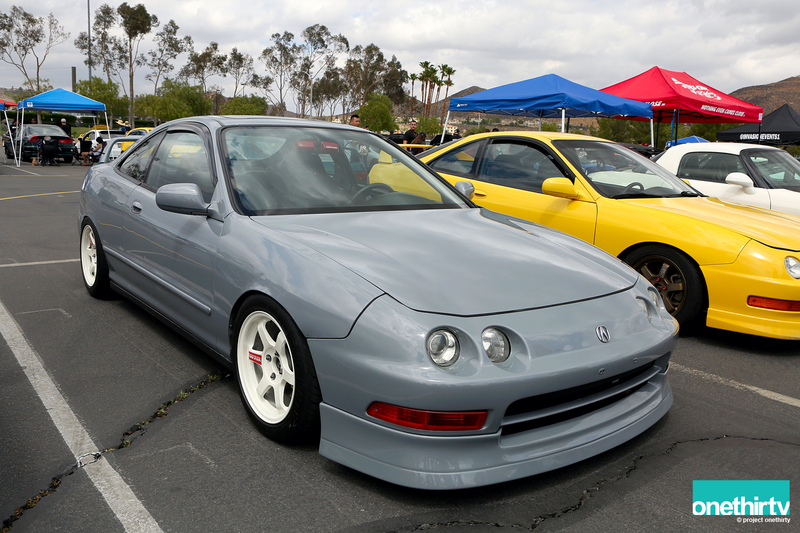 I will end our Eibach coverage with two photos that I took of Jorge’s EG. 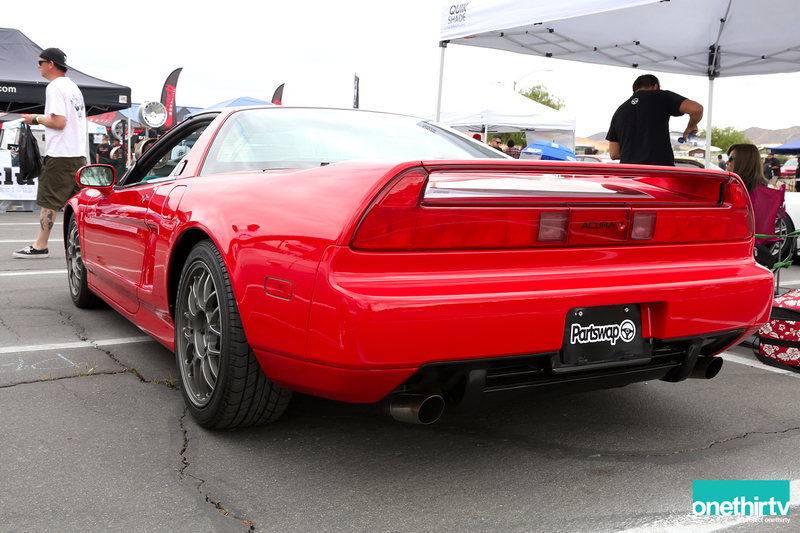 One was shot last year at the Eibach meet. 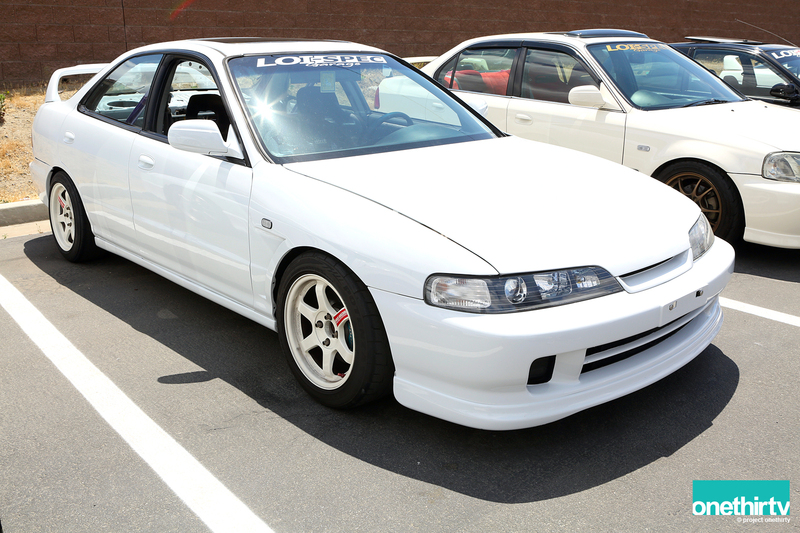 The second one is this year – on the drive down to the Eibach meet. I am amazed that every time I see this car, it looks different. Even though the changes are subtle, Jorge has managed to make his EG just a little better.